Research background: In the literature, there is a discussion on the importance of the spatial distance from the user in the context innovation activity. However, most of this kind of studies concentrate on exporting enterprises and compare them to domestic ones. Exporting activity is very important for catching-up countries, because of technology transfer in its background. 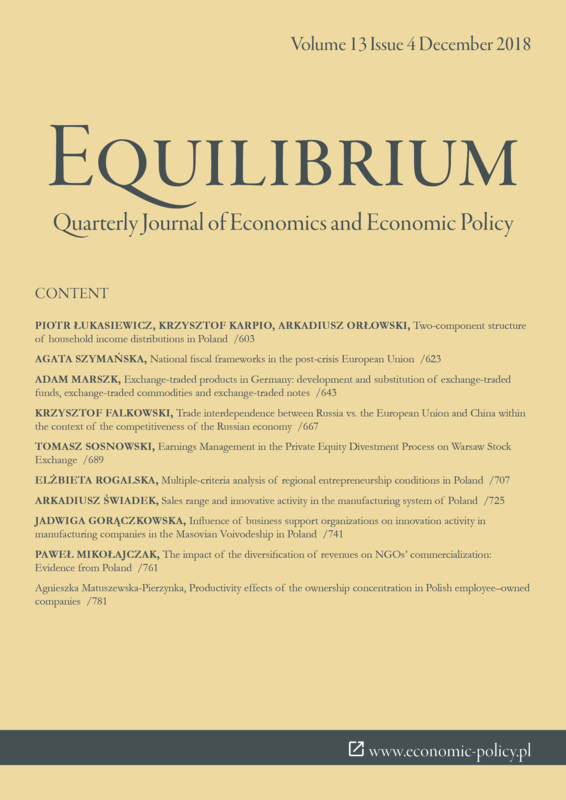 Purpose of the article: The aim of this paper is to determine whether the innovative activity in Poland’s manufacturing system is a consequence of close interactions (local and regional), or perhaps conditioned by the imperative of functioning on the national and international market. The main hypothesis was that on the current development level of Poland, the relationship between the range of sales and innovation activities are different from those in the more developed countries. Methods: Empirical studies was created in 2006–2012 as a result of the systematic collection of questionnaires filled by manufacturing enterprises in Poland from all regions (5209 correct fulfilled questionnaires). Methodical analysis was based on the theory of probability — probit modeling, because dependent variables were binary (0 or 1). Findings & Value added: Local and regional space is not stimulating innovation activity in opposite to national one. High intensity observed only when the company has been working on the international market. It means that the industry maturity level in Poland is good enough for creating a domestic innovation environment. This kind of an aggregation level should be stimulated by the government innovation policy. Becker, S. O., & Egger, P. H. (2013). Endogenous product versus process innovation and a firm’s propensity to export. Empirical Economics, 44(1). doi: 10.1007/s00181-009-0322-6. Bernard, A. B., Eaton, J., Jensen, J. B., & Kortum, S. (2003). Plants and productivity in international trade. American Economic Review, 93. doi: 10.1257/000282803769206296. Blalock, G., & Gertler, P. (2004). Learning from exporting revisited in a less developed country. Journal of Development Economics, 75, doi: 10.1016/j.jdeve co.2004.06.004. Daszkiewicz N. (2014). Firm-level internationalisation from the theoretical perspective: knowledge-based approach. In N. Daszkiewicz & K. Wach (Eds.). Firm-level internationalisation and its business environment: knowledge-based and entrepreneurial approach. Gdańsk: Gdańsk University of Technology Publishing House. Delgado, M. A., Farinas, J. C., & Ruano, S. (2002). Firm productivity and export markets: a non-parametric approach. Journal of International Economics, 57(2). doi: 10.1016/S0022-1996(01)00154-4. Dzikowski, P. (2012). Developing the innovation potential of a medium sized family business functioning in a global supply chain. Management, 16(1). doi: 10.2478/v10286-012-0008-6. Filipescu, D. A., Prashantham, S., Rialp, A., & Rialp, J. (2013). Technological innovation and exports: unpacking their reciprocal causality. Journal of International Marketing, 21(1). doi: 10.1509/jim.12.0099. Garcıa, F., & Avella, I. (2008). La influencia de la exportacion sobre los resultados empresariales: analisis de las pymes manufacturers espanolas en el periodo 1990-2002. Revista Europea de Direccion y Economıa de la Empresa, 17(2). Gorynia, M., & Jankowska, B. (2007). The internationalization theories of the firm: a short review. Gospodarka Narodowa, 10. Greenaway, D., & Kneller, R. (2007). Firm heterogeneity, exporting and foreign direct investment. Economic Journal, 117. doi: 10.1111/j.1468-0297.2007. 02018.x. Impullitti, G., & Licandro, O. (2018). Trade, firm selection and innovation: the competition channel. Economic Journal, 128(608). doi: 10.1111/ecoj.12466. Johanson, J., & Vahlne, J. (1997). The internationalization process of the firm – a model of knowledge development and increasing foreign market commitments. Journal of International Business Studies, 8(1). doi: 10.1057/palgrave. jibs.8490676. Johanson, J., & Vahlne, J. (2009). The Uppsala internationalization process model revised: from liability of foreignness to liability of outsidership. Journal of International Business Studies, 40(9). doi: 10.1057/jibs.2009.24. Johanson, J., & Wiedersheim-Paul, F. (1975). The internationalization of the firm: four Swedish cases. Journal of Management Studies, 12(3). doi: 10.1111/j. 1467-6486.1975.tb00514.x. Mińska-Struzik, E. (2012). Learning by exporting as a source of innovation in Asian companies.Prace Naukowe Uniwersytetu Ekonomicznego we Wrocławiu, 256. Mińska-Struzik, E. (2013). Znaczenie eksportu w działalności innowacyjnej polskich przedsiębiorstw wysokiej techniki, IX Kongres Ekonomistów Polskich pt. Ekonomia dla przyszłości. Odkrywać naturę i przyczyny zjawisk gospodarczych, Warszawa 28-29 listopada. Monreal-Perez, J., Aragon-Sanchez, A., & Sanchez-Marın, G., (2012). A longitudinal study of the relationship between export activity and innovation in the Spanish firm: the moderating role of productivity. International Business Review, 21(5). OECD (2003). Tax incentives for research and development: trends and issues. Paris. Rodil, Ó., Vence, X., & del Carmen Sánchez, M. (2016). The relationship between innovation and export behaviour: the case of Galician firms. Technological Forecasting and Social Change, 113. doi:10.1016/j.techfore.2015.09.002. Romer, P. M. (1990). Endogenous technological change. Journal of Political Economy, 98. doi: 10.1086/261725. Schweizer, R., Vahlne, J.-E., & Johanson, J. (2010). Internationalization as an Entrepreneurial Process. Journal of International Entrepreneurship, 8(4). doi: 10.1007/s10843-010-0064-8. Wagner, J. (2007). Exports and productivity: a survey of the evidence from firm-level data. World Economy, 30(1). doi: 10.1111/j.1467-9701.2007.00872.x.